Parking: Park your vehicles in the parking lot at 10717 Main Street. It’s the same location as the Clarence Farmer’s Market. The ride ends at the Cornerstone Bar & Grill at (10651 Main Street) with is next door to the parking lot! Event fee: Free! Please consider bringing a warm clothing item donation. Route: The bike route is 1.8 miles long – all on Main Street. The ride is a slow, crawl…it’s meant to be relaxing and conversational, no huffing n’ puffing here. This will be an up-n-back ride. The ride departs from Clarence Bowling Academy. There will be a group leader who will lead the ride. The ride will stop at four addition restaurants & pubs along Main Street, before ending with a ride party at Cornerstone Bar & Grill. Locations: Clarence Hollow Bistro (10641 Main Street), Gianni Mazia’s (10325 Main Street), Penny Lane Cafe (10255 Main Street), Clarence Grille (10250 Main Street) and Cornerstone Bar & Grill (10651 Main Street). At each location, they will have a free appetizer for riders to enjoy, as well as drink specials. Each location has both alcohol and non-alcohol beverages. 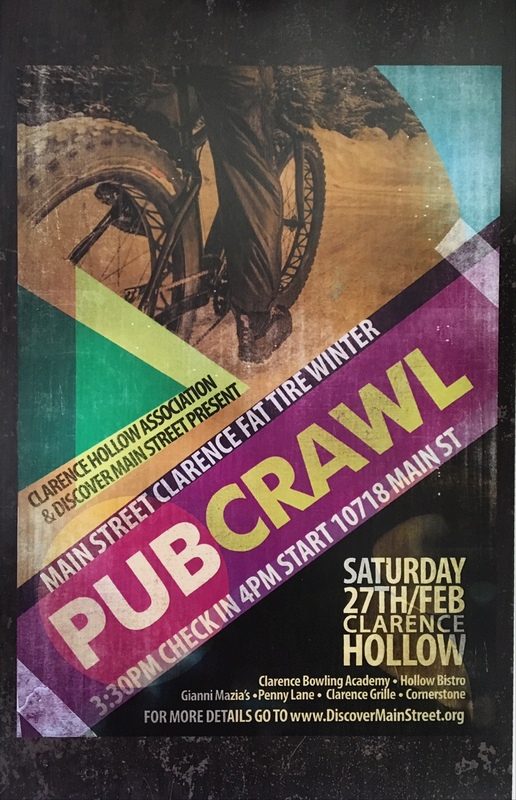 Post-Ride Party: The last stop will be the Clarence Bar & Grill. There will be live music featured at the Cornerstone. All riders must conduct themselves in a responsible manner. Riders must wear a helmet. Bright clothing is encouraged. Riders must abide by the rules of the road.